I had a reaction to something in here so Iâ€™ll be giving it to a friend to use! 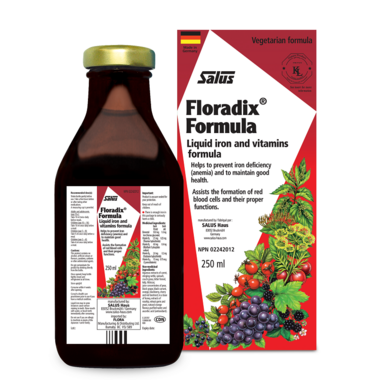 Have been using Floradix for years and loving the taste. Easy to take and does not upset stomach. The twice daily recommended 10 ml makes the 500ml bottle last 4 weeks for one person. It goes down easily and tastes like apple juice. There is only a very slight metallic aftertaste. It also doesn't cause constipation like other supplements containing iron. My first and only choice when my iron has gotten low - have felt way less drowsy, weak and tired. Really good product easy on your stomach. I used to take other brand pills but they are made nauseous. Floradix makes easier to take the Iron. Oh my gosh, this stuff has changed my life for the better. Sometimes I forget to take it for a spell and the anemia symptoms come right back (mainly exhaustion). Better than any pill. Just brush your teeth after to prevent stains. So glad to purchase through Well, as I live in a rural area and the product is very hard to find.